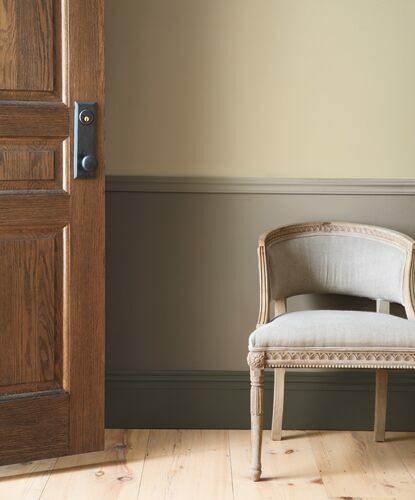 Get inspired – and seal in certainty – with these essential paint colour pointers. Colour really does make the room. The perfect shade and finish can enlarge a small space, bring in more light, or deliver that kick of energy you need with your morning coffee. But finding the right one? Now that’s another story. Take a tour of the colour wheel here! To get started, take a look at a colour wheel: Warm reds, yellows, and oranges congregate on one side, while cool lavenders, blues and greens are on the other. Creating a palette within one half of the wheel tends to be more harmonious. But pairing two colours that stand opposite one another adds a dash of invigorating tension. Which do you prefer? A monochromatic colour scheme uses tints and shades of the same colour. An analogous colour scheme uses adjacent colours on the colour wheel. Complementary colour schemes (as in "opposites attract") include two colours that are opposite to each other on the colour wheel. 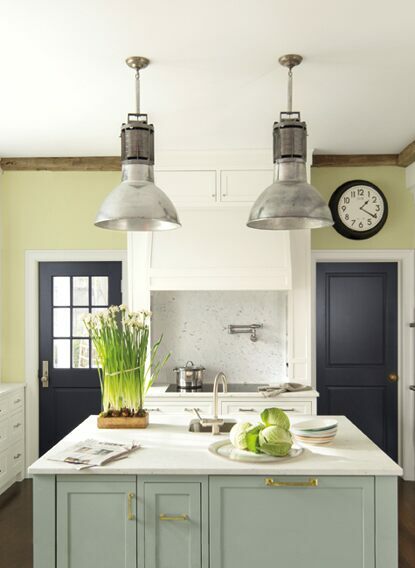 Pales, neutrals, whites and deeps: These are the four simple categories the Benjamin Moore Colour and Design Team suggest using to make choosing colours more manageable. Delve deeper into the emotional impact of each of these colour categories in The Psychology of Colour, and while you’re there, click on a range of colours in the interactive tool to see how colours influence a room’s mood. Glossy white trim is a classic, but why not think beyond white or cream? A coloured trim against a neutral wall will showcase a room’s unique architecture. 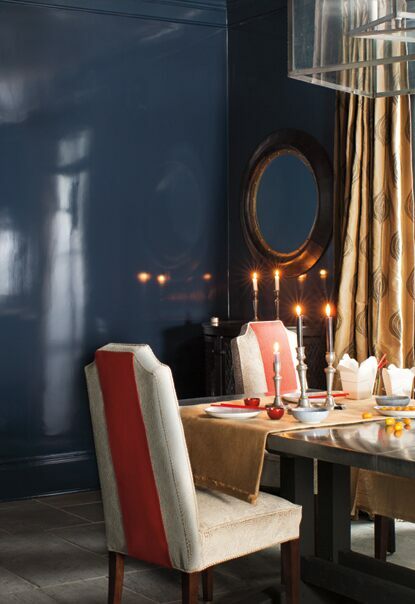 Or consider an ombre effect by painting walls different shades of one colour, with darker hues closer to the bottom. "Time of day matters when it comes to assessing colour." Light in a room changes many times throughout the day. From the natural light of early dawn to the artificial light of nightfall, the interplay of light and colour is a crucial component when it comes to choosing your perfect paint colours. 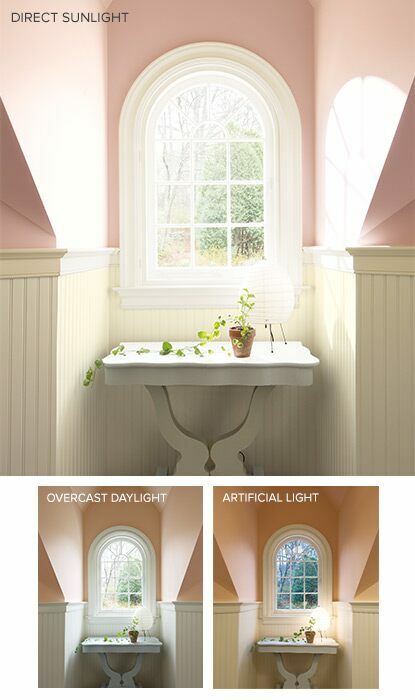 As seen here, bright midday sun will wash out most pale hues (top); that same hue will be flattered by softer, indirect illumination (lower left), while artificial light will add a warm glow to the wall colour (lower right). Pick up a pint sample to experience your colour choice, from morning to night. To make sure you choose your colour with confidence, tap into pint-size colour samples. With these handy samples, you can paint a board – foam core will do nicely – and move it around to different parts of a room. Monitor how the paint colour changes at different times of the day so there are no surprises once you’ve applied your paint colour choice. Choosing the right sheen can enhance colour. Painting the walls in a gloss will add dimension and levity. Semi-gloss on a low ceiling will move light around the space and create the illusion of height. From a practical standpoint, remember that shinier finishes look best on smooth, well-prepped (e.g. spackled, sanded, etc.) surfaces, while matte or flat paints are more forgiving of imperfections. Take a first-look at sheens here. Then visit your local Benjamin Moore store for a closer look. Visit an independently owned Benjamin Moore retailer to see sheen samples–first hand–before you decide. 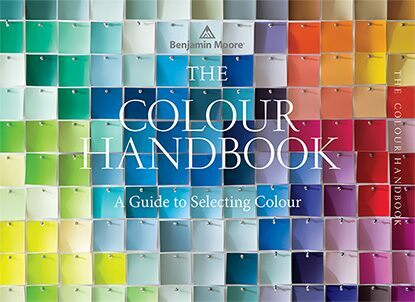 Visit one of the 5,000 locally owned and operated Benjamin Moore stores, and pick up your own copy of The Colour Handbook: A Guide to Selecting Colour for more inspiration.